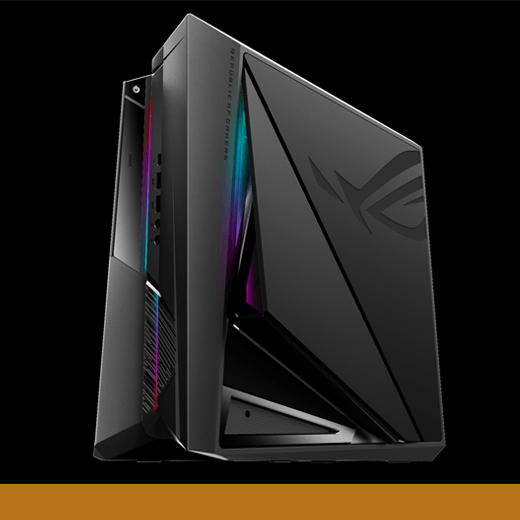 The ROG G21 is a high-performance compact 13L gaming desktop with cyber-warrior and cyber-punk design elements. It has an aggressive, angular chassis with sharp creases that reflect a warrior’s battle scars. The G21 has a magnetically secured cover that can be opened to improve airflow into the system, give the CPU and GPU a performance boost, and activate Aura light effects. The G21 also has side panels that can be opened to provide easy access to internal components for hardware upgrades. Designed by: Lai Sin Fei, Chan Wai Tong and Chiu Szu Tang of ASUSTek Computer Inc.